I'm a total sucker for these stories, since having a good time on the Outer Cape doesn't depend on being able to spend a lot of money. When I first started to come out we had a young family and camped at Maurices Campground, in Wellfleet, to keep the costs down. Enjoy! The story is in the Boston Globe...Here. These stats (and a few others) will have a dramatic effect on the Cape and it's infrastructure as these homes become permanent residences, mostly to the water systems. Read the article from the Cape Codder, or take on the whole report at http://www.capecodcommission.org/. Second-Home Owners - Likely "Out of Luck"
The Federal government seems to want to help just about everyone, except second home owners. Read the story on the Wall Street Journal's MarketWatch website. This past Saturday my family, including my son, his wife, & their 2 children, had a 'summer' picnic dinner on Coast Guard Beach. Although it was a tad chilly, the beach was a great place to be - to enjoy the sand, surf, the grandkids, and the activity of the early beachgoers. The picture is of my 4 year old grandson, Henry. Dr. Beach (a.k.a. Stephen Leatherman) has named Eastham's Coast Guard beach as 9th in his annual list of 10 best beaches in the US. Eastham's premier Atlantic coast beach makes the top ten almost every year. Go to the WBZ website for the whole story. This time of year we hear a lot about the piping plover, a small bird that's on the endangered species list. The egg laying and early development of the plover make it easy prey for preditors and difficult for us humans to not inadvertantly destroy them. Check out this short video from the American Field Guide, shot in New Jersey. You might also want to read a very informative article published on BNET.com about the piping plover, entitled "This Bird Is No Chicken". The new movie, "The Lightkeepers" is being filmed at various locations on the Outer Cape. The well known actors Richard Dreyfuss and Blythe Danner are shooting in Chatham, Wellfleet, and Provincetown for a film, set in 1912, about a man who has sworn off women, until 2 'interesting' women move in near the lighthouse where he lives and works. 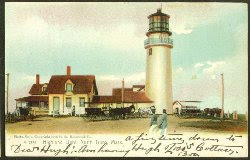 The setting will be a fictional combination of the Highland Light (in Truro) and Provincetown's Race Point Lighthouse. Read the two stories about the 'shooting'. The Cape Codder ran a story in last week's edition. Likewise, the Boston Herald ran a story in their Inside Track section. I took this photo a few days ago at the end of Cole Rd while looking for herring in the herring run. 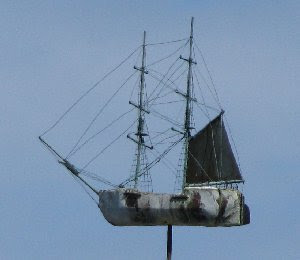 I didn't see any fish, but the sky was crystal clear and this weathervane caught my eye. The detail is exceptional (notice the rigging). Cool! EASTHAM NEW LISTING - Delightful contemporary Cape with lots of extras. Downstairs the wide 2 story foyer features a skylight, a large closet and built-ins. The kitchen/dining area has a rustic fireplace and looks out across the deck to the ever-changing marsh. The front-to-back living room overlooks the marsh and has a fireplace/wood stove to keep you warm on those cool evenings. Upstairs are 2 large bedrooms, a large walk-in closet, and a loft that can be your TV room or an office area. Couple all this with a mudroom/entry with a shower area and washer/dryer and a 2 car garage and you have a great year-round home in an area of up-scale homes near Boat Meadow Beach and Orleans. New for 2009 are a completely re-done kitchen with new appliances and refinished oak hardwood floors. Listed at $777,000. Check out this listing on my website - see a map, more photos, and a virtual tour. Pricing your home for sale is an in-exact science. Not without it's pitfalls, both for the homeowner and for the Realtor. HGTV's FrontDoor.com website ran an article - "6 Pricing Mistakes and How to Avoid Them". Good advice, especially in today's market. 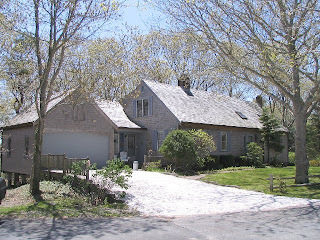 The good news is that the Outer Cape market seems to be improving, with a fair number of Buyers and a good inventory at all price ranges. Want details? - subscribe to my monthly newsletter...Here. The Hartford Courant ran a article about the beauty and peace of kayaking the nooks and crannies of the Nauset Marsh, in the Cape Cod National Seashore. The article highlighted the chance encounters with birds of many varieties, with the varied shoreline as well as the different currents and tides, making for an ever changing experience. I've kayaked this same marsh, leaving from Hemenway Landing, and I thoroughly enjoyed the experience. Enjoy the whole article...Here. While I wasn't watching, I got Flocked! 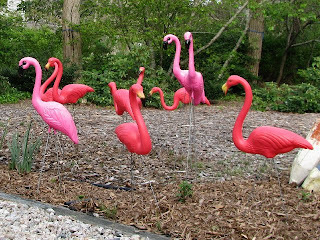 A flock of a dozen lawn flamingos arrived at my front door as part of the Lions Club's 2009 fundraiser. Someone paid $20 to 'flock' me in the hopes that I will likewise flock someone else. The money all goes to the Lions, to support their community help activities, such as specialized glasses for folks who can't afford them. A neat idea! 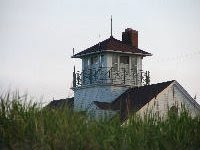 Check out the local Lions at http://www.lighthouselions.org/. Cape Cod Today - Online ran an article with a video that 'celebrates' spring's coming. Lots of beautiful images. Check it out ... HERE! Three Outer Cape Towns in "100 Best"
The New York Post is running a series they are calling the "100 Best Places that summer has to offer" within 6 hours of New York City. Three Outer Cape towns made the list. Check out the stories and slideshows for Orleans (destination #9), Provincetown (#11), and Wellfleet (#85). My prior life is represented also, Hyde Park (NY) is #89. A deflated balloon, launched by the students at Mark Twain Elementary School in Carthage, Missouri, was picked up on the beach in West Yarmouth. The balloon took only 4 days to make the 1500 mile journey. Read the story in the Carthage Press. The balloon was apparently part of an science experiment. It's Mothers Day. I'm sure my wife, Beverly, would agree that today was a great Mother's Day. It started with church and Sunday school, followed by a brunch at the Jailhouse Restaurant with friends, and then 18 holes of golf at Yarmouth's Blue Rock Golf Course. The weather was perfect for golf and Bev beat me handily. I need the practice. Badly. Blue Rock is one of the finest Par-3 golf courses in the country. 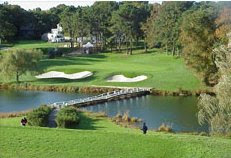 The photo on the right is of the signature 9th hole, a 169 yard shot over water onto an elevated green. The men's blue tees are slightly higher than the green while the ladies' red tees are below, forcing the ladies to tee-off uphill. 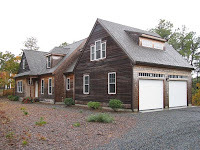 Wellfleet - New Listing - This is a new listing for a fabulous 3000 sqft house in Wellfleet overlooking the marsh. This home has 4 bedrooms, 3 1/2 baths, hardwood floors, granite counters (kitchen and bathrooms), a full walkout basement, A/C, and a 2 car garage. The listing price is $899K. Go to http://150blueheronrd.robertsheldon.com/ for more photos and a virtual tour. The Cape Cod National Seashore will be the beneficiary of President Obama's stimulus package, to the tune of about $4.2M. The Seashore will use the funds to finish the Province Lands bike trail (about half of the 7.3 mile trail was completed last year), the Province Lands Visitors Center and the Race Point Ranger Station. There will be a few other updates as a result of this cash infusion, also. Go to the story on the Wicked Local website for the details. The Cape Cod Times has posted a video about the Cape Cod Maritime Days. The host highlights the Cape Cod Maritime Museum in Hyannis, the "Outer Beach" (aka Coast Guard beach), and Eastham's Three Sisters lighthouses. Check out the video and the Maritime Days website. The events started May 2nd and go to May 31st. At last night's Eastham Town Meeting a number of 'hot' articles were debated and passed. Another, the 9.7% rental property tax, was soundly defeated (rjs - YEAH!). This tax on rental home rentals would have put Eastham at a serious disadvantage since most (if not all) neighboring towns also rejected this tax. At long last the Town of Eastham is on the road to a municipal water system with the approval of a $3M+ study to determine the best path to town water. Although the study will take a few years, it begins a journey that (hopefully) will ensure a continuing water supply into the future, as water quality slowly (but surely) deteriorates. This decision will need to be ratified with a Proposition 2 1/2 override vote scheduled with town elections on May 19th. Likewise, wind turbine measures were approved, both residential and municipal. The municipal turbine vote made the 2/3's majority required by one vote. Read the details in the Cape Cod Times article... Here. Selling your home in this market is a combination of a beauty contest and an on-line auction. Not only does your house have to look better than the other 'contestants', but it needs to present itself well online, which includes price. 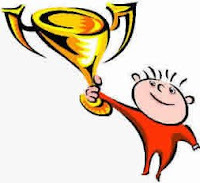 Check out this article for 7 worthwhile ideas to make your home a 'winner'. As far as online goes, my listings can be found on well over 100 websites. These include REMAX.com, Realtor.com, Yahoo, Google, Postlets, Trulia, and many, many others. Also, as part my listing process, I create a virtual tour of each home. So you think everything costs an arm and a leg on Cape Cod? Try these activities on for size. 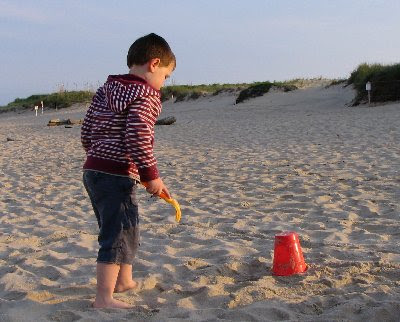 Go to .. 10 Free Things To Do On Cape Cod. 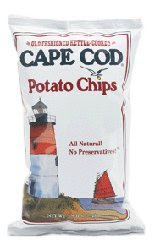 The Cape Cod Potato Chip Factory is a great rainy day activity. Munch, munch!